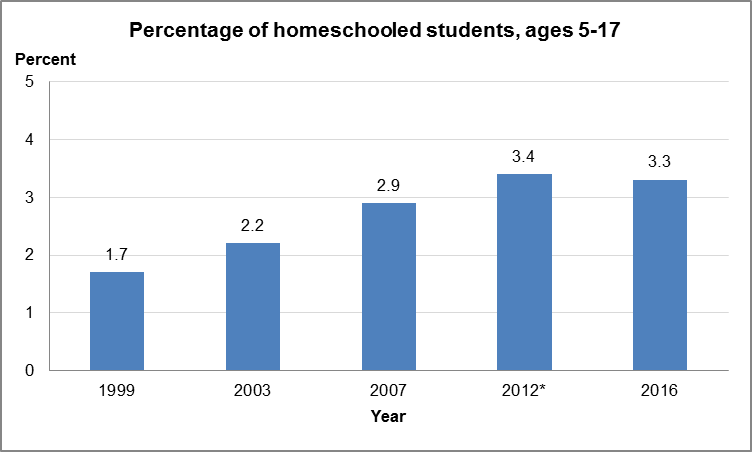 A Fresh Look at Homeschooling in the U.S.
From 1999 to 2012, the percentage of students who were homeschooled doubled, from an estimated 1.7 percent to 3.4 percent. But that increase appears to have leveled off, according to newly released data. In 2016, about 1.7 million students (ages 5-17) were estimated to be homeschoolers, which translates to about 3.3 percent of all K-12 students. This rate is not statistically different from the percentage in 2012. SOURCE: U.S. Department of Education, National Center for Education Statistics, Parent Survey of the National Household Education Surveys Program (NHES), 1999; Parent and Family Involvement in Education Survey of the NHES, 2003, 2007, 2012, and 2016. These data come from the recently released First Look report on the Parent and Family Involvement in Education (PFI) survey from the National Household Education Surveys Program (NHES). In this survey, parents were asked a number of questions about their child’s education. Using these data, NCES is able to identify students who are schooled at home instead of school for some or all classes. So, why did parents say they homeschooled their kids? The most important reason for homeschooling in 2016 was “concern about the school environment, such as safety, drugs, or negative peer pressure,” reported by 34 percent of parents of homeschooled students. (This was also the most commonly reported reason selected by parents in 2012.) Other reasons cited as most important by families of homeschooled students in 2016 were dissatisfaction with academic instruction at other schools (17 percent of homeschooled students’ parents) and a desire to provide religious instruction (16 percent). The PFI survey is uniquely suited to collect data about homeschooled students because it collects data from households rather than schools or other institutions. It includes a suite of surveys designed to capture data related to learning at all ages and is ideal for trend analyses because of the repeated measures over time. The NHES:2016 First Look report for the PFI data also provides key estimates related to school communication with parents, homework, parents’ involvement in their students’ education, and homeschooling. The data will be available to researchers in the coming months. Check the NHES website for updates. Students who are homeschooled primarily because of a temporary illness and students who attend school for more than 25 hours per week are not counted in NCES’s estimate of homeschooling. Despite a national interest in nondegree credentials—such as postsecondary certificates, occupational certifications, and occupational licenses—there hasn’t been comprehensive, national data on these programs. However, a new report from NCES fills this gap using data from our new Adult Training and Education Survey (ATES). These data show that 27 percent of adults have a nondegree credential and that 21 percent have completed a work experience program (such as an apprenticeship or internship). The ATES data also show that the completion of degree programs and nondegree programs are related. For example, having a certification or license is more common among adults who have a college degree than among adults with lower levels of education. The ATES is one component of the NCES National Household Education Surveys Program (NHES), which collects information on education-related topics that cannot be addressed through school-based surveys. It includes a suite of surveys designed to capture data related to learning at all ages. This most recent NHES administration, conducted from January to September 2016, was the first administration of the ATES. This survey was completed by a national sample of about 47,700 adults between the ages of 16 and 65. The data show that nondegree credentialing and work experience programs are particularly common in the health care field. In fact, health care was the most common field in which both certifications and licenses were held, and the most common field for which adults had completed a work experience program. 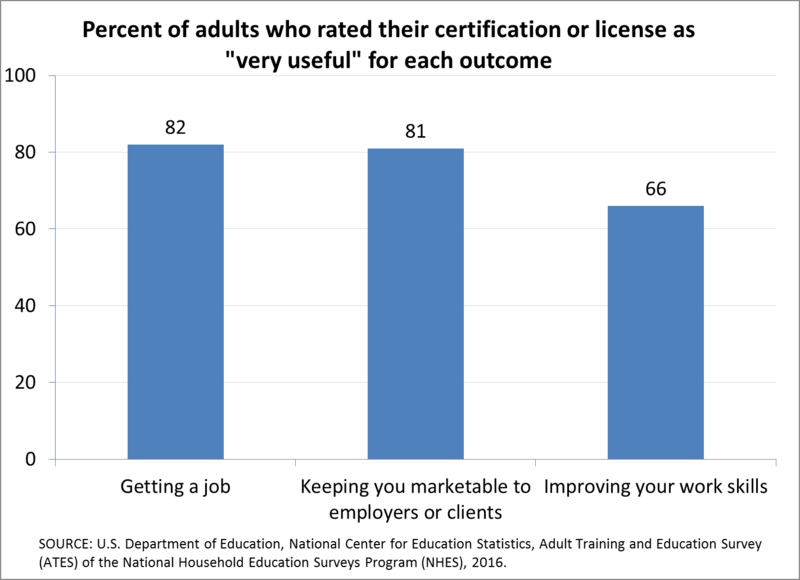 The ATES also found that adults perceive nondegree credentials to be useful for many labor market outcomes. For example, 82 percent of adults who have a certification or license reported that it was very useful for “getting a job”, 81 percent reported that it was very useful for “keeping you marketable to employers or clients”, and 66 percent reported it that was very useful for “improving your work skills” (see figure). The ATES data will be available to researchers in the coming months. Check the NHES website for updates. More than 3,915,918 individuals were employed by degree-granting postsecondary institutions in 2015. These employees provided services and support to the 19,977,270 students attending the nation’s 4,562 degree-granting institutions. We know this information—and much more—because of the Integrated Postsecondary Education Data System (IPEDS), a program in the National Center for Education Statistics (NCES). In fact, these data points only scratch the surface of information collected and updated annually by IPEDS. Each year, IPEDS issues 12 surveys to all postsecondary institutions receiving Title IV Federal Aid and some institutions that participate by choice. The surveys provide data on a broad range of topics, from enrollment, admissions, and cost to grad rates, faculty, and human resources. These data are reported by gender, race/ethnicity, institution type, and more. But we don’t just want people to know about the data – we want them to use it! The “Use the Data” landing page (see image below) provides many options for analysis. Users can look up and compare institutions, view trends and statistical tables for specific data points, download a complete survey file, customize a data file, or download a report summarizing the data for specific institutions. There are many options for analysis given the extensive data collection and number of tools. One tool, the IPEDS Trend Generator, allows users to select a subject and question to observe trends over time. The trend generator allows users to explore enrollment trends, among many other topics. Below is an example of a bar graph that can be generated using this tool. 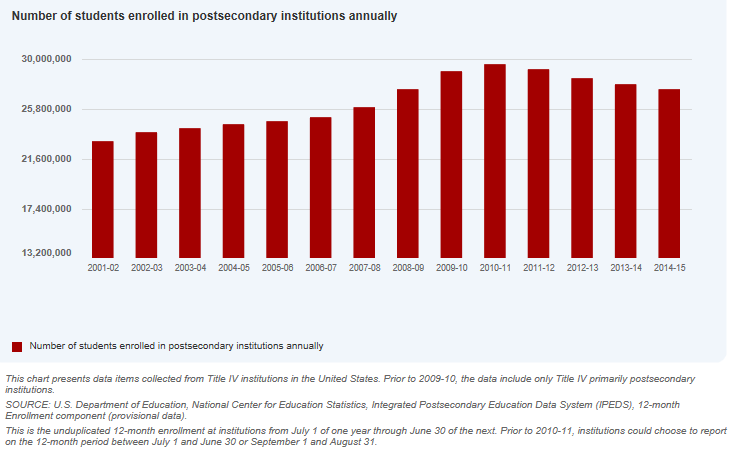 With the click of a couple of buttons, you can quickly learn that the number of students attending postsecondary institutions (as measured by 12-month enrollment) has been declining in recent years, after peaking in 2010-11 at 29,522,688 students. By 2014-15, enrollment decreased to 27,386,275 students, a decline of more than 2 million students. In addition to producing graphical displays, data from the Trend Generator can quickly be exported to an Excel file. Users also have the option to create custom data files which can be exported to Excel, SAS, STATA, or SPSS files. Users can choose individual or specific institutions using their own criteria, or groups of similar institutions can be selected at once by using predetermined categorizations. Some pre-set groupings include whether the institution is the state’s land grant institution, a Historically Black College and University, or a tribal college. Institutional groupings can also be selected by geographic characteristics and other groupings, such as highest degree offered, availability of distance education, and Carnegie classification. The full list of institutional groupings can be found on the IPEDS website. After selecting the institutions, users can choose the variables to be analyzed. In the screenshot below, you can see that the variable “number and salaries of non-medical full-time staff” allows users to select breakouts by academic rank, such as professor, associate professor, lecturer, etc. These breakouts can provide greater detail with regard to current and average salary. Once the variables are selected, the desired data file is complete and can be exported into one of the available formats. The Integrated Postsecondary Education Data System contains a multitude of data which can be accessed for all levels of analysis, whether you are an experienced statistician or just a casual user. If you are using the data and have questions or comments, contact the IPEDS Help Desk by phone at 1-877-225-2568 or by email: ipedshelp@rti.org . Sarah Souders was a 2017 summer intern for NCES. She is a student at The Ohio State University. Title IV of the HEA authorizes the federal government’s primary student aid programs, which are the major source of federal support to postsecondary students. Title IV aid includes programs like Pell Grants, Stafford Loans, Perkins Loans, Supplemental Educational Opportunity Grants, and Federal Work Study. If an institution accepts aid from programs authorized by Title IV of the Higher Education Act of 1965, as amended (20 USC 1094, Section 487(a)(17) and 34 CFR 668.14(b)(19)), then they are required to complete all IPEDS surveys. More than 900 people attended the 2017 STATS-DC Data Conference, August 1-3, at the Mayflower Hotel in Washington, DC. Sponsored by the National Center for Education Statistics (NCES), STATS-DC is an annual, free conference designed to provide the latest information, resources and training on accessing and using federal education data. Educators, statisticians, and researchers from around the country attended the conference and many of them took to Twitter to share what they were learning and seeing. Below is a collection of those Tweets that used the #STATSDC2017 hashtag. You can view the conference agenda and get more information about STATS-DC on the NCES website. Information about the 2018 conference should be available next spring. Data from two recent NCES reports—the Condition of Education and the Digest of Education Statistics—show that student homelessness is a challenge in many different types of communities. In 2014-15, the rate of homelessness among U.S. public school students was highest in city school districts at 3.7 percent, but was also 2.0 percent or higher in suburban, town, and rural districts. While suburban districts had the lowest rate of student homelessness, they still enrolled 422,000 homeless students, second only to the 578,000 homeless students enrolled in city districts. Smaller numbers of homeless students were enrolled in rural (149,000) and town (139,000) districts. NOTE: Homeless students are defined as children/youth who lack a fixed, regular, and adequate nighttime residence. For more information, see "C118 - Homeless Students Enrolled" at https://www2.ed.gov/about/inits/ed/edfacts/sy-14-15-nonxml.html. Data include all homeless students enrolled at any time during the school year. Data exclude Puerto Rico and the Bureau of Indian Education. SOURCE: U.S. Department of Education, National Center for Education Statistics, EDFacts file 118, Data Group 655, extracted January 23, 2017, from the EDFacts Data Warehouse (internal U.S. Department of Education source). Common Core of Data (CCD), "Local Education Agency Universe Survey," 2014–15. See Digest of Education Statistics 2016, table 204.75b. The majority of students experiencing homelessness (76 percent) were doubled up or sharing housing with other families due to loss of their own housing, economic hardship, or other reasons such as domestic violence. Seven percent were in hotels or motels; 14 percent were in shelters, transitional housing or awaiting foster care placement; and 3 percent were unsheltered. The percentage of homeless students who were doubled up with other families ranged from 70 percent in city districts to 81 percent in rural districts. The percentage of homeless students who were housed in shelters was higher in city districts than in suburban, town, and rural districts. 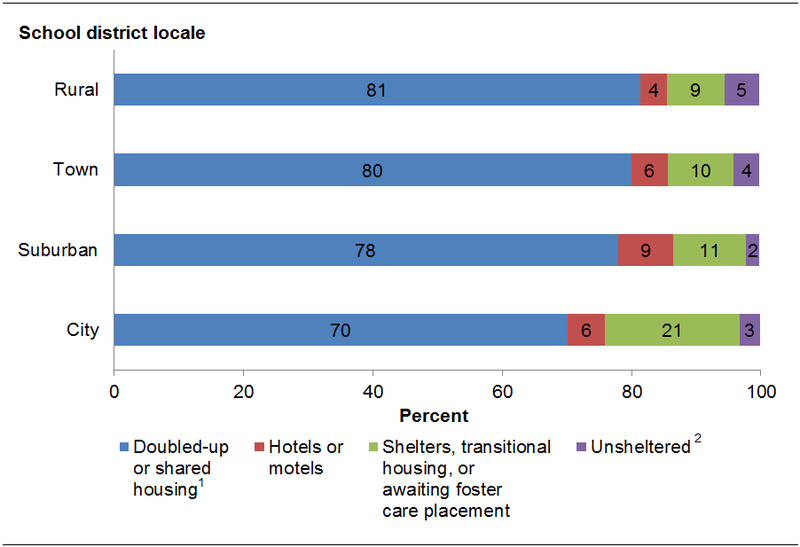 The percentages of homeless students who were unsheltered or living in hotels and motels varied less widely across district locale categories. 1Refers to temporarily sharing the housing of other persons due to loss of housing, economic hardship, or other reasons (such as domestic violence). 2Includes living in cars, parks, campgrounds, temporary trailers—including Federal Emergency Management Agency (FEMA) trailers—or abandoned buildings. NOTE: Homeless students are defined as children/youth who lack a fixed, regular, and adequate nighttime residence. For more information, see "C118 - Homeless Students Enrolled" at https://www2.ed.gov/about/inits/ed/edfacts/sy-14-15-nonxml.html. Data include all homeless students enrolled at any time during the school year. Data exclude Puerto Rico and the Bureau of Indian Education. This figure is based on state-level data. The percentage of homeless students who were unaccompanied youth–meaning that they were not in the physical custody of a parent or guardian—was highest in rural districts (9.3 percent) and lowest in suburban districts (6.9 percent). The percentage of homeless students who were English language learners was highest in urban districts (16.8 percent) and lowest in rural districts (5.9 percent), and the percentage who were migrant students was highest in town districts (3.4 percent) and lowest in urban districts (1.0 percent). Data used in this analysis were collected under the McKinney-Vento Homeless Assistance Act of 1987. This legislation requires that school districts identify students experiencing homelessness and guarantees students’ right to enroll in public schools and access educational and transportation services. More information on this legislation and the U.S. Department of Education’s programs and resources focused on student homelessness can be found on the National Center for Homeless Education’s website. States report aggregated data on homeless students to the U.S. Department of Education through the EDFacts collection. EDFacts covers all public school districts and provides a uniquely detailed view of student homelessness. The full data on student homelessness by school district locale is available in the Digest of Education Statistics. A broader analysis in the Condition of Education describes how student homelessness has changed over time and how it varies among states. You can view homeless student data for the 120 largest school districts here and download a dataset with information on all public school districts here.